SAORI VSA arts ng Pilipinas are implemented therough a satelite system of voluntarisum/collaboration of people with civic-minded interest for people with or without disabilities. SAORI VSA arts ng Pilipinas provides direct technical assistance to collaborators and parters for the effective implementation of the following programs. Provides youngsters with a valuable life long social acdvantage by using free art expression through SAORI hand weaving. It enhances therapy by developing motor skill, cognitive and social skills, too. Teachers, students and their families coming from all walks of life can use this new initiative, which provide the tools necessary to create unique meaningful expression of this kind of craft SAORI Weaving. SAORI - VSA arts ng Pilipinas festivals are community-based events that celebrate Creativity. The power of free expression in weaving is usually showcased through work done. The color, techniques and design presented mirror the feelings of the weaver. The festivals and exhibit also strengthen the commitment of each and everyone who is involved in the organization to nurture and provide support to one another. SAORI Weaving is a form of therapy for individuals with special needs. It has helped people with disabilities by improving their motor skills, behavior and attention span. It has given them a sense of self-esteem that promotes inclusion in the society and dignity in their work as a form of livelihood. Angel Carbonilla is a Deaf SAORI Artist who has been teaching weaving and Basic Sign Language in Museo Pambata for five years. “Maghabi at Matuto” was his first solo exhibition. During the event held on November 28, 2007, we invited kids together with their parents and teachers. These children with disability are presently studying at public schools within Metro Manila. The launching of Angel’s exhibit was attended by teachers and students from Legarda Elementary School, P. Gomez Elementary School, M. Hizon Elementary School, Justo Lukban Elementary School, Palma Elementary School and Aurora Elementary School. This is in coordination with the Department of Education in Manila. Angel Carbonilla’s story and works serve as an inspiration to all, especially to children with disabilities. 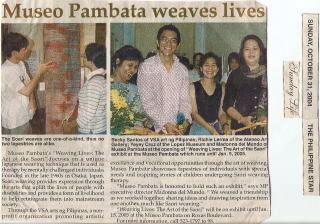 Through the help of VSA arts Philippines and support from Ms. Rebecca M. Santos, Angel was able to continue his service to Museo Pambata as a SAORI Artists, a volunteer and an Origami Teacher to our visitors. SAORI Weaving has been part of our regular activities, which is held every fourth Saturday of the month. Presently, Angel Carbonilla’s work can be seen at the Museo Pambata Mini-Gallery. 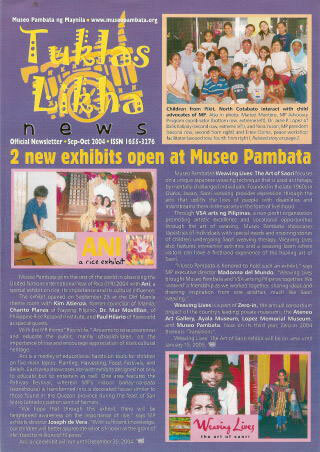 All his artworks are for sale to support Museo Pambata programs.